1.1 The legal relationship between you and us shall be governed exclusively by these General Terms and Conditions of Sale (the ”Terms and Conditions”) set forth herein. Changes and amendments must be in writing. Conflicting provisions of your terms and conditions shall not apply even if they are not expressly opposed by us in each individual case. 1.2 Our quotations are not binding; your orders shall become binding and the sales contract shall come into force only when we have confirmed your order in writing or, if our confirmation note deviates from your order, when agreement on the deviating items has been reached in writing. If an export licence is required for the export of the Products and if such licence is not granted, the sales contract shall be deemed automatically cancelled. 1.3 The provisions of the agreed delivery term of Incoterms 2000 shall also apply, but in the event of conflict of terms, these Terms and Conditions shall govern. For the purposes of these Terms and Conditions, ”Delivery” shall mean that delivery is made according to the agreed delivery term of Incoterms 2000. 1.4 If any one or more provisions of these Terms and Conditions should be invalid, in whole or in part, the validity of the sales contract shall not in any way be affected thereby. 2.1 Unless otherwise agreed, prices shall be quoted, if the sales contract is made with IP-holding GmbH, Ex Works IP-holding GmbH’s factory in Herborn, as we shall specify and all in accordance with Incoterms 2000. 2.2 Our prices do not include any sales tax (value-added tax) or import duty; this must also be paid by you if the sale is subject to such tax or duty. You shall assist us in a suitable manner in any proceedings concerning the collection of any taxes, duties, fees or other charges, and provide us with the necessary documentation. Costs arising from any necessary certification or legalization of commercial documents, as well as customs duties and other charges, fees and taxes if the sales contract is made with IP-holding GmbH shall be borne by you. 2.3 If the sales contract is made with IP-holding GmbH by the uniform currency of the European Union ”EURO”, the official conversion rate on the official day of conversion, the resultant payment of debts in ”EURO” and all other consequences of the currency change shall not constitute a violation of the sales contract, nor shall they entitle either party to the sales contract to take legal action. 3.1 If the sales contract is made with a customer located in Germany payment shall be made as set forth in the sales contract. 3.2 If the sales contract is made with a customer located outside of Germany and unless otherwise agreed, payment shall be made on Delivery by irrevocable letter of credit (”L/C”) to be opened in our favour and confirmed by a bank in Germany. The ”Uniform Customs and Practice for Documentary Credits” (UCP 500) of ICC, 1994 edition, shall govern the L/C and all costs and charges arising from the opening and maintenance of the L/C shall be borne by you. 3.3 Terms of payment: 50% with order intake, 50% with shipment confirmation Each order will be charged a flat fee of 100, 00 (one hundred) €. 3.4 Deductions (e.g. taxes, fees) shall not be permitted. 3.5 For purposes of determining its timeliness, a payment shall be deemed to have been made on the day the payment is credited to our account, or, in the case of checks and drafts, on the day they are paid. 3.6 Your obligation to pay shall be fulfilled only when the full amount invoiced is irrevocably credited to our account so that we may draw upon such funds freely and without being burdened by any reserve for reclamation. 3.7 We may set off any claims we may have against you against claims for payment which you may have against us. Without prejudice to further claims, we may charge default interest on any past due amounts from the due date at a rate equal to the costs incurred by us (including, without limitation, credit charges and processing costs). 3.8 You may set off only claims which are either uncontested by us or which have been adjudicated and are final and unappeasable. 3.9 If you default in payment or we have reasonable doubt as to your solvency or credit standing, we may, without prejudice to any other rights we may have, accelerate all claims arising out of our business relationship and make the delivery of the Products subject to prepayment. 4.1 Our compliance with the term of delivery presumes the timely receipt of all data to be supplied by you, the granting of all necessary permits and releases, your observation of the agreed terms of payment and the performance of all of your (collaborative or anticipatory) obligations, which are preconditions to the performance of our obligations. If these preconditions are not met in a timely manner, the term of delivery shall be appropriately extended. The term of delivery shall be deemed to have been complied with when, within the term of delivery, the products leave our factory or you have been advised that the products are ready for shipment. 4.2 If you shall cause interruption or delay of our contractual performance, corresponding additional costs shall be borne by you, and the term of delivery shall be extended appropriately. 4.3 If we shall be unable to comply with the term of delivery because of strikes, lockouts or unforeseeable events beyond our control, including, without limitation, mobilization, war, insurrections, changes in law, acts of government, shortages of materials or energy, incorrect or late supplies in spite of careful choice of suppliers, business interruption or transportation difficulties, we may extend the term of delivery appropriately. 4.4 If we are responsible for any delay in delivery, you may, either cancel the sales contract after the expiration of a reasonable extension granted in writing, or claim damages up to a maximum aggregate amount not in excess of 5 % of the value of the undelivered Products, provided you can prove that you actually suffered a loss as a result of the delay. Claims for damages, whether contractual or statutory, in excess of the amount set forth in the preceding sentence shall be subject to the limitations and exclusions of liability stipulated in Section 12 below. 4.5 Delivery may be made in partial shipments. 5.1 Unless otherwise agreed, we shall determine the route and mode of transportation. 5.2 The risk of loss of, or damage to, the Products shall pass to you in accordance with the agreed delivery term of Incoterms 2000. If the dispatch, collection or delivery is delayed or becomes impossible for reasons beyond our control, we shall notify you accordingly and grant you a reasonable period of time for removal of the Products. Upon expiration of this period, we may store the Products in our warehouse or elsewhere, at your cost and risk. Upon such storage, our contractual obligation to deliver shall be deemed to be fulfilled, and the risk of loss of or damage to, the Products shall pass to you. 6.1 Obvious defects, incorrect shipments and shortages not caused by transport shall be reported to us in writing immediately, and in any event not later than 4 weeks after receipt of the Products. 6.2 If delivered by carrier, you may accept Products with externally visible damage or loss caused by transport only if you note such damage or loss on the freight documents, and this note is countersigned by the carrier. This also applies when internal or latent damage or loss can be assumed on the basis of the external condition of the shipment (e.g. damaged packing). Damage or loss caused by transport which is not externally visible shall be reported to the carrier immediately after discovery. In both cases you shall notify us immediately by telefax or email. 6.3 If you do not act in accordance with Sections 6.1 and 6.2, the Products shall be deemed to be complete and in conformity with the sales contract. 7.1 To the extent permitted by the law of the country to which the Products are delivered, we shall reserve title to the delivered Products (the ”Secured Products”) to secure the payment of all contractual claims we have against you for payment. 7.2 If you have purchased the Secured Products for resale you may dispose of the Secured Products in the ordinary course of business. This authorization shall terminate when you default in your obligations, become insolvent, or when legal bankruptcy, reorganization or similar proceedings are filed or instituted against you. 7.3 Upon termination of your authority in accordance with Section 7.2, we may demand the temporary return of the Secured Products at your expense, in order to secure our title to the Secured Products. 7.4 At our request, you shall furnish us with all relevant information about the inventory of the Secured Products. You shall notify us immediately of attempts by third parties to levy upon and sell the Secured Products and support us, at your expense, in securing our title to the Secured Products. 7.5 If reservation of title is not permitted by the law of the country to which the Secured Products are delivered, we may demand from you other, equivalent security (e.g. security interest, charge, or guarantees). You shall be obligated to collaborate in all measures which are necessary and legally permissible to secure our claims, and to notify us immediately if third parties assert claims, liens, or charges which endanger our title to the Secured Products. 8.1 After installation of the Products at your site an acceptance test according to our acceptance test procedures will be conducted. An acceptance test in our factory will be conducted only if previously agreed. 8.2 The Products are accepted and acceptance shall have occured, when the Products have successfully passed the acceptance test. Acceptance may not be refused because of minor defects, although such acceptance does not relieve us from our obligation to remedy said defects. 8.3 If you waive an acceptance test or do not attend the test, we reserve the right to conduct the test without you and you shall accept the test results. Additional costs resulting from the delay of such tests for reasons beyond our control shall be borne by you. In any event the Products shall be deemed accepted when you have taken them into service. 9.1 We warrant that the Products shall be free from defects in material and workmanship. Subject to the provisions of Section 6 above, if you report any such defect to us, we will, at our option, either replace or repair the Product free of charge. We shall decide whether defects will be repaired at the facility where the Products are used, or at the facilities of one of our representatives or subsidiaries or at our factory. If we decide not to repair the defects at the facility where the Products are used, you shall, at your expense, pack the defective products properly and safe for shipment and send them to the address designated by us. If we do not remedy the defect after the expiration of a reasonable period of time agreed to by you in writing or if several attempts at repair or replacement have failed, you shall be entitled either to reduce the purchase price by a reasonable amount which may not exceed 10% of the purchase price or to return the Product and demand a refund of the purchase price. 9.2 Unless otherwise agreed, the limitation period for warranty claims shall be 12 months from the date of acceptance. In any event, the limitation period shall terminate 15 months after Delivery. The limitation period for spare parts shall be 3 months after Delivery. 9.3 You shall immediately notify us of defects which appear and do everything within your power to keep the damage to a minimum. 9.4 We shall be obligated to remedy defects only if you comply with your contractual obligations. In particular, agreed payments must be made in accordance with the payment terms, and you may withhold payments only in an amount which bears a reasonable relationship to the defects which have appeared. 9.5 Defects resulting from normal wear and tear or from mishandling shall not be covered by this warranty. Our warranty obligation shall terminate if the Products are modified or repaired by you or third parties not authorized by us. 9.6 The following provisions shall apply to software: Only software defects which can be reproduced at any time shall be considered to be defects covered by our warranty obligation. We shall remedy software defects which substantially impair the use in accordance with the sales contract, at our option and depending on the extent of the defect, either by installation of an improved version of the software or by advice to how to eliminate such defects or to avoid their effects. We do not warrant that the software will function without error in each configuration you select, unless such configuration has been specified by us. 9.7 Save claims for damages the foregoing are your exclusive remedies in the event of a breach of warranty. ALL WARRANTIES, INCLUDING EXPRESS AND IMPLIED WARRANTIES OF MERCHANTABILITY AND FITNESS FOR A SPECIAL PURPOSE, OTHER THAN THOSE EXPRESSLY SET FORTH HEREIN ARE EXCLUDED TO THE EXTENT PERMITTED BY LAW. Any claims for damages, whether contractual or statutory, shall be subject to the limitations and exclusions of liability stipulated in Section 12, in particular claims for compensation for damages not incurred by the Product itself (consequential or indirect damages). 10.1 Should claims be brought against you for infringement of industrial property rights or copyrights (the ”Rights”) existing in your country based on your use of a Product delivered by us, we shall defend you against such claims and pay any costs or damages either adjudicated or allowed by us to the owner of such Right, provided that you notify us immediately in writing of such claims and all defences and measures to reach a settlement out of court are reserved to us. Under these conditions we shall generally obtain for you the right to continue to use the Product. If this proves impossible under economically feasible conditions, we shall, at our expense and at our choice, either modify or replace the Product so that it no longer infringes the Rights or take the Product back and reimburse you for the purchase price paid to us, adjusted to take into account the age of the Product. You shall not have any other or further claims arising out of the infringement of the Rights. We shall not be liable for infringement of Rights arising out of a modification of a Product delivered by us, use of such Product in a manner other than as specified in our publications or use of such Product in combination with other products not supplied by us. 10.2 We shall not be liable for infringement of Rights based on a Product manufactured by us in accordance with your drawings, designs and specifications. In such case you shall indemnify us and hold us harmless against claims of third parties. 10.3 You may not change the exterior of a Product to allow you or a third party to appear to be the manufacturer, or remove our trademarks from, or affix your trademarks to, the Product. 10.4 We reserve title and copyright to cost estimates, drawings and other documents supplied by us; they may be made available to third parties only with our prior written consent. Drawings and other documents relating to quotations shall be returned to us immediately upon request if no order is placed with us. The preceding sentences shall apply analogously to your documents; they may, however, be made available to such third parties from which we commission, or intend to commission, supplies or services. You shall be granted a non-exclusive, non-transferable license to use programs, relating documentation and subsequent up dates exclusively in connection with the Product on which you initially use such programs, documentation and up dates. You shall have no further rights to the programs, relating documentation or subsequent up dates; we shall remain sole owner of the copyrights. You shall not without our prior written consent make these programs, relating documentation and subsequent up dates available to third parties, nor - even for your own purposes except for one backup copy - copy or otherwise duplicate them. 12.1 Liability for damages on our part and on the part of our employees and officers, regardless of the legal basis involved - including the breach of any legal obligation in connection with contract negotiations, breach of contract, default, tort or impossibility on our part - shall, subject to further limitations and exclusions in the following paragraphs, be limited to the cases in which a) the damage arises from wrongful intent or gross negligence or the breach of an express warranty or b) ordinary negligence results in a breach of an essential contractual obligation other than the breach of an express warranty - but in the case of this subsection b), liability shall be limited to the foreseeable damage and to a maximum amount of 50,000 Euro if the sales contract is made with IP-holding GmbH for economic loss and damage to property and 500,000 Euro if the sales contract is made with IP-holding GmbH for personal injury. 12.2 Any claims for damages shall be further limited in addition to the limitations contained in Section 12.1 so that, in the event of ordinary negligence, we shall not be liable for indirect damage including, without limitation, consequential damage in the form of property loss or loss of profits. Our liability for indirect damage shall be limited to 50,000 Euro if the sales contract is made with IP-holding GmbH in the event of gross negligence. 12.3 For software, the liability set forth in Sections 12.1 and 12.2 is applicable to such damages (e.g. loss or transformation of data) only, which are suffered despite you have performed a data backup in a machine-readable form at intervals adequate to the application concerned, but not later than at the end of the day on which the software was used. 13.1 If the sales contract is made with IP-holding GmbH, at its option, the courts of Limburg (Germany) or of your registered office or place of business shall have jurisdiction. 13.2 If the sales contract is made with IP-holding GmbH, the law of Germany shall govern, with theexclusion of the United Nations Convention on Contracts for the International Sale of Goods (CISG) of April 11, 1980.
especially designed and built according to customer requests. are also provided by KSI with an excellent pricing. The v-series has an outstanding performance for the most common applications in research and production. for Bonded Wafers, MEMS, Through-silicon Vias (TSV), LEDs, Sensor, IGBT, PCB, Automotive, Air and Defense, Bonding Layers, Defects, Delaminations, Voids, Cracks and Porosity. Bio Med and Geology Applications. For many years, we are supplying Acoustic Microscopes, Transducer, Pulser and Receiver worldwide. 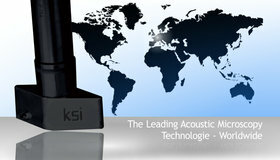 The well-known KSI quality is a guarantee for the best results. The new patent based developed streamlined shape of the Transducer reduces turbulences, air bubbles and cavitations in coupling fluid significantly. This allows an increase of the scanning speed up to 50% with the correspondent electronics.